I found this image over at Holy Kaw!, and my imagination took flight. 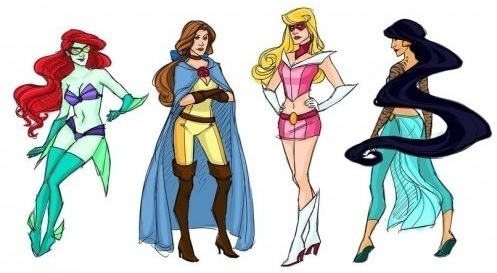 So what would these Princesses be like were they superheroes? Ariel had the power to not only talk to the sea creatures, but to entrance men with the power of her voice. Locked in an eternal struggle with Ursula, the Dark Witch of the Sea, Ariel's stories would be like a mashup between Thor and Aquaman, as she defended the Merfolk of Atlantis from the Demonic Deep Ones. Cunning and powerful, Jasmin was able to control her mighty tiger Raja. Together with Belle, this crime fighting duo be more than a match for their foes in stories reminiscent of Black Panther, Cheetah, and Catwoman. Cinderella would be a blend of Jubilee and Yuna from Final Fantasy X-2. Her dancing empowers her, and slays her foes. Imagine the choreography for the fight scenes, they would be LXD epic! What other Princesses need a Superhero makeover? What would there powers be?